Toward the end of 2014 Inchoo had an intern join our design team. As we knew that soon after that we would need one frontend intern also, we created one project for both internships. 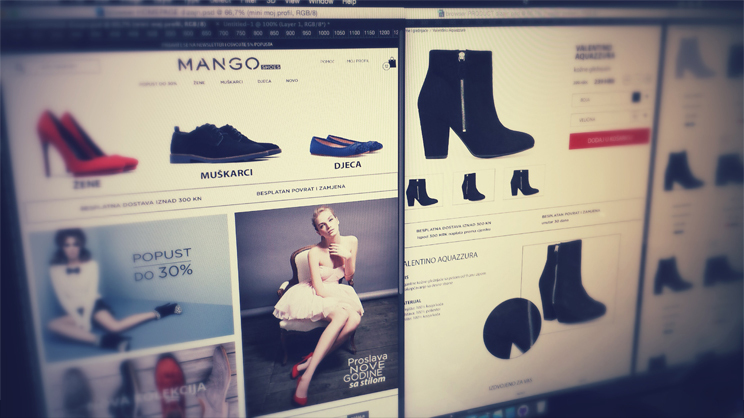 The task was to design and create an imaginary web shop for Mango Shoes. Kristina joined as the intern for design team in December, with a Masters in Information Science and a few small projects behind her she stated that the internship gave her an opportunity to work on her first large, complex project which required detailed planning and preparations. Mirna was our new frontend intern whose job it was to turn Kristina’s design into code. Mirna’s a 1st year student of Mathematics and Computing, this was to be her first serious attempt to work in frontend. She realized soon after arriving at Inchoo that the experience she had prior to beginning work at our company was more like just stacking up code without fully understanding it. How was your knowledge before this internship? What were your weak points and did they improve? Kristina: My knowledge of design was basic and partly theoretical. After I began working on such a complex project I started to realize how important the UX (user experience) is. That all really changed after the internship and now when visiting a web shop I start considering the design and how it could be improved. Mirna: My knowledge before the internship was quite basic. Regarding the frontend, I literally didn’t know what a selector in CSS was even though I had worked with them before the internship, but it was obviously without understanding. If something didn’t work, I’d try different options until it looked the way I wanted it to, without actually thinking about what it was. I think the biggest problem I faced was that I wasn’t sure where to start. I thought that talent was the key to development and that knowledge was a distant second. I’m now certain that with hard work and really learning those core skills creates the building blocks of success. Just as with any professional athlete or sport, knowledge of the basics is fundamental. How did you like the internship? What was most interesting? Kristina: I liked it a lot. Along with the working culture and environment I never had the feeling that I was an intern, rather an employee. I had my own desk in an office with two colleagues and an 8-hour working day that went by very quickly. All aspects of my time there was interesting, but the most pleasant surprise came from the relaxed but productive working environment. Mirna: Internship at Inchoo? If you’d take me, I’d do it again! I’m sure that this is one of the best working and learning experiences an intern could have. Within a month I learned so many useful things without even realizing, learning is always easier when you enjoy your work place and the people you work with. The experience also made me realize how much more there is to learn. How much did you learn and can you point something out as most important? What was the biggest challenge for you? Mirna: Wow I would have to say the first two weeks were the biggest challenge, but most definitely I found it difficult to get use to asking for help when I need it, and not trying to figure it out on my own for hours before asking for help. Regarding how much I learned, I think that my mentor could give the best answer, but without false modesty; when I started my internship I knew how to count to 5, now I have learned to count to 105, maybe more. The way I was working before the internship was like building with Lego cubes, googling and placing parts I found appropriate without fully understanding what they were for and what they exactly were. I’ve learnt that it’s so important to understand what you’re doing and why, again knowing and understanding the fundamentals is imperative. In teams there’s no room for improvisation, you need to know what you’re doing and how to implement it as others depend on you. Kristina: I’ve learned a lot during my internship, every day I learned something new. It was great that I worked on my own project, from first phase sketching to creating the final design in Photoshop. The big challenge is forethought, the need to think about every detail that you usually wouldn’t notice. Also finding the balance between a design that looks good and follows UX good practice, but is also technically plausible. Mirna, the design you got was made by Kristina. How was it? Was it hard to “cut” it? Mirna: I presume I should say all nice things about the design, but I’ll be honest and say that sometimes it really wasn’t easy. There were moments when I asked “Who did this design?” as I wasn’t sure how the designer imagined it. Of course, mostly I followed the designs and did everything as it was planned, after all we shouldn’t argue with designers. Kristina, while you were working on wireframes, did you have in mind that they will soon be in hands of a frontend developer? Kristina: When I started working on the project, I wasn’t aware my project was going to leave the office, so at the beginning I didn’t think about whether it was possible. I was advised to consider it so in the end my project looked a bit differently than I imagined it. If I had known from the beginning that design was going to be used, I would definitely do some things differently and I would have consulted with frontend developers. Mirna, is there something in the design that you thought needed to be changed? Mirna: There were a few things. Some parts were a bit confusing, and since Kristina and I weren’t working on the project at the same time, I couldn’t ask her why she did something the way she did and if she can change it so I did it my way. Considering that I was an intern and it was all new to me I couldn’t really objectively criticize the design. I was frustrated at times that I didn’t know how to do somethings the way it was designed. I believe that if it was a real project I’d suggest a few changes but only to make it a bit easier for myself. They both agree that the internship outdid their expectations and their month at Inchoo went by extremely quickly. The internship gave them practical knowledge, real work/life scenarios and guided them toward a clear understanding of what they want out of their career. After finishing her internship, Mirna returned to her prior commitments – university and everything else that goes with it; she tells us that continued learning is the key. Kristina’s confidence soared after her experience at Inchoo and begun freelancing shortly after, we are happy to announce though that as of the 1st of April she will be joining our design team once more, but this time as an employee. Their message to future interns is to use every minute of the experience to learn as much as you can and to give your all, you definitely won’t regret it in the end.